This is the former royal residence built in a blend of the Rajasthani and Mughal styles. Situated in the heart of the old city, this is a magnificient structure and has fascinated me everytime I have seen it. Timings : 0930 - 1630 hrs. A stone observatory. Largest of the five remarkable observatories made by Jai Singh in five different cities. Its complex instruments represents the high points of medieval Indian astronomy. Most striking of them are Ram Yantras which are used for guaging altitudes. Timings : 0900 - 1700 hrs. 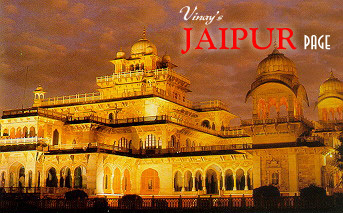 Hawa Mahal or Palace of Winds has become a symbol for Jaipur all over. Built in 1799 AD, this five storey building along the main street of the old city is full of semioctagonal and delicately honey combed sandstoned windows. Also called Isar Lat, this is the highest tower dominating the skyline on the western side of the Tripolia Bazar. It was built by Sawai Iswari Singh in 1749 AD to commemorate a grand victory. Very recently it has been opened for public. It provides the best view of the city. A lush spacious garden with a zoo (There are plans to shift it from here), a museum, an auditorium and popular sports ground. It was built by Sawai Ram Singh II in 1868 AD as a famine relief project. The Albert Hall - another of my favourite building structure and a fine example of Indo-Sarcenic style of architecture designed by Sir Swinton Jacob, was opened later with an exquisite collection of sculptures, paintings, decorative wares, natural history specimen, an Egyptian mummy and the celebrated persian carpet. Timings : 1000 - 1630 hrs. The Rabindra Manch with an auditorium, a modern art gallery and an open air theatre has been the centre of city's cultural life since long. The Bagh is situated in the heart of the modern city and so provides an easy escape to the citizens from the hustle-bustle of daily life. It has gone through many changes in recent times but thankfully it's still a good place to have a jog in the morning or a walk in the evening. The full-length exquisitely carved statue of Sawai Jai Singh in white marble in the center of the circle was erected to pay homage to the founder of Jaipur. In recent times, it has become a very popular joint. The big circle attracts large crowds in the evenings especially on weekends. The newly constructed Birla Complex which houses an excellent auditorium besides a planetarium and a gallery for exhibitions provides an excellent backdrop to the circle. Beautifully landscaped gardens, laid out in the 18th and 19th century by kings and courtiers dot the narrow gorge in the south eastern corner of the walled city, along the road to Agra. Sisodia Rani Garden has tiered multilevel gardens with fountains, water channel and painted pavilions. Amongst others, Vidyadhar -ka-bagh is the best preserved one. It was built by the planner of the city, Vidyadhar. An ancient pilgrimage center, lying beyond the gardens amidst low hills east of the city. Temples, pavilions and holy kunds(natural spring and reservoirs) along with lush landscape make it a delightful spot. The small temple of the Sun god, built by Diwan Kriparam on the top of the highest peak is visble from all parts of the city. A beautiful complex of palaces, halls, pavilions, gardens and temples built by Raja Man Singh, Mirza Raja Jai Singh and Sawai Jai Singh over a period of about two centuries still stand in magnificient state. The palace complex emerges dramatically from the placid waters of the Maotha lake. A spectacular pillared hall - Diwan-e-Aam, Palace of Glass - Sheesh Mahal and a double storeyed painted gateway Ganesh Pole are two of the numerous architecture marvels in the palace. The well-proportioned Kesar Kyari in the center of Maotha lake and the Dilaram Bagh at its north end provide a spectacular view of the palaces above. Timings : 0900 - 1730 hrs. One of the few military structures of medieval India, retaining its ancient splendour in palaces, gardens, reservoirs, a granary, an armoury, a well planned cannon foundry, several temples, a tall tower and a giant mounted cannon - the Jai Ban, one of the largest in the country are preserved here. Timings : 0900 - 1630 hrs. This is a sentinel to the Pink City. It dominates the city's western skyline and can be seen from anywhere in the city. Although much of it is in ruins, the lovely building added by Sawai Ram Singh II and Sawai Madho Singh II provides interest to the fort. Provides a spectacular view of the city. Timings : 1000 - 1800 hrs. The Kanak Vrindawan Complex of fine temples and gardens has been recently renovated to their pristine perfection. The place has become a favourite to the citizens for picnics and goths. Provides some of the excellent views of the hills and the Jal Mahal. The Island Palace, Jal Mahal built by Sawai Jai Singh I, is a fascinating spot at the centre of Man Sagar Lake. A new five-star deluxe hotel is in construction along the road in front of Jal Mahal. To the west of this road is the royal crematorium at Gaitore in a narrow valley with some spectacular cenotaphs of all the Jaipur rulers except Sawai Ishwari Singh who was cremated outside the Jai Niwas Garden. Most imposing is the chhatri of Sawai Jai SIngh II with intricate carvings and a graceful shape. Moti Doongri is a privately owned hilltop fort built like a scottish castle. The Ganesh Temple at the foot of the hill and the marvellous Lakhsmi Narayan Temple (Birla temple) built in marble a few years back are also worth watching. There are several other hotels and those in the list above are in no way my recommendations. Besides, there are also many people who provide their residences for paying guests. The list can be obtained from RTDC (Rajasthan Tourism Development Corporation). Comments and suggestions are always welcome. Send me an e-mail.